Hello and welcome back! It's day 4 of the My Favorite Things October release countdown, and this is probably my favourite day! I love the new products being revealed today, and I have a few projects to share. 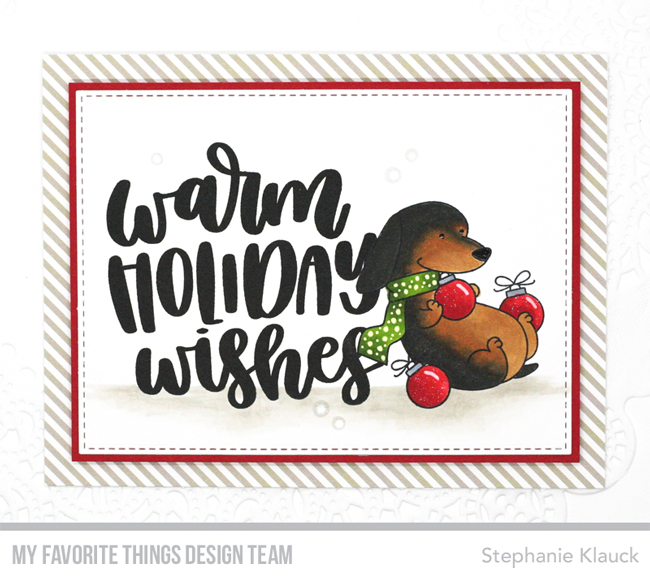 For my first card, I used the new Birdie Brown stamp set called Happy Pawlidays and paired it with the Warm Holiday Wishes stamp from yesterday to create a one layer card. I wanted to make it look like the puppy was leaning against the sentiment, so I stamped him first, masked it and then stamped the sentiment over top. I coloured the pup with Copic markers to look my puppy Molly, and I gave her a green polka dot scarf and made all of the ornaments red. I added glitter to the ornaments with a clear glitter marker and then I diecut the panel with one of the new A2 Stitched Rectangle STAX dies. 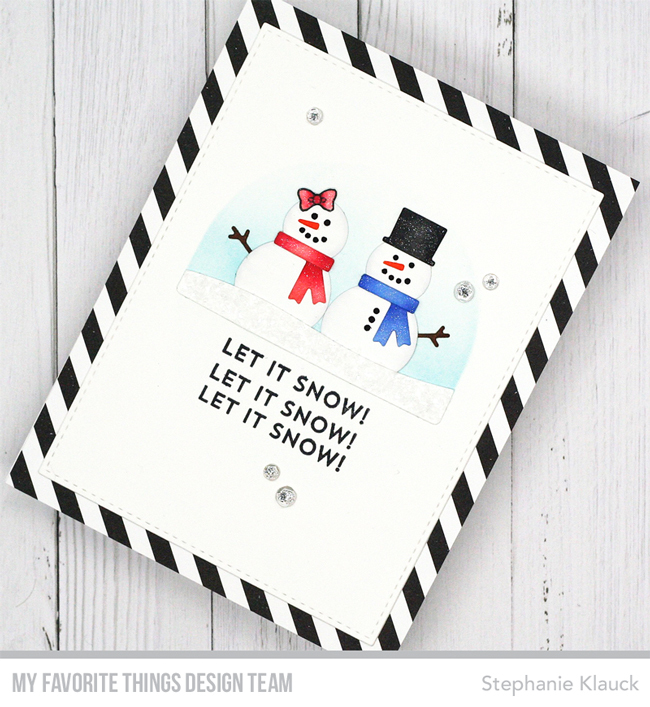 For my next card I used the new Lip Balm Window & Frame Die-namics, the new Lip Balm Pouches and the Free with $60 this month - Let It Snowflake Too. 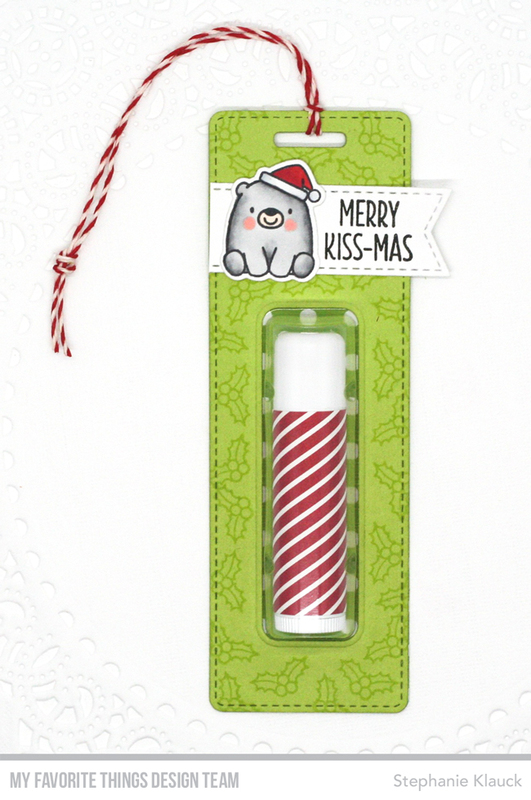 And for my last project today I used the new Tall Tag Duo dies along with the lip balm products to create a cute stocking stuffer. I created a custom lip balm by adding patterned paper to it and then I created a tag that holds the lip balm. 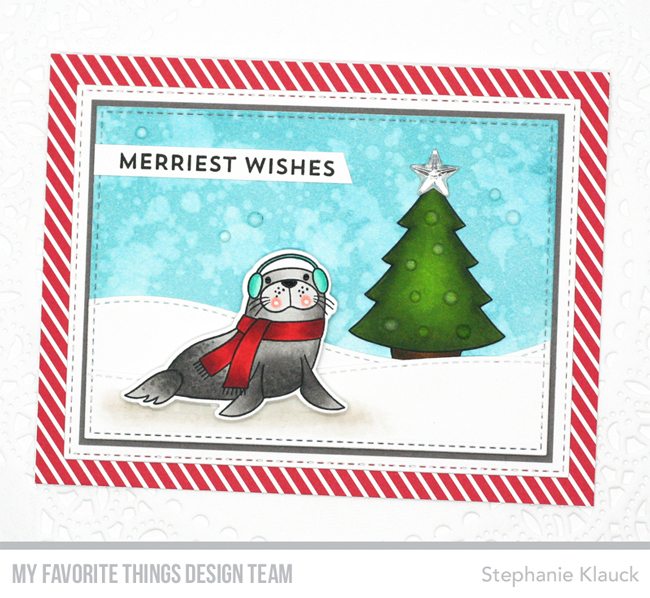 I added a sentiment from the new Sending Smooches stamp set and embellished it with a Christmas bear from the Bitty Bears stamps set. Thank you so much for joining me for day 4 of the October release countdown! 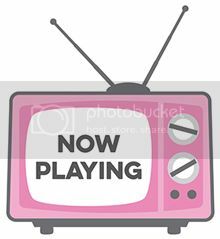 See you tomorrow for more countdown fun! 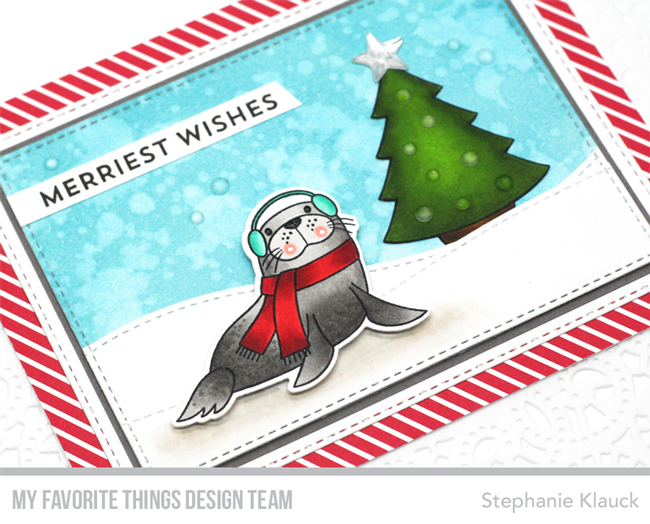 For my card today I used the new Polar Pals stamp set and Die-namics and created a holiday winter scene. These stamps don't have to be used for holiday cards, but I really wanted to Christmas it up LOL! 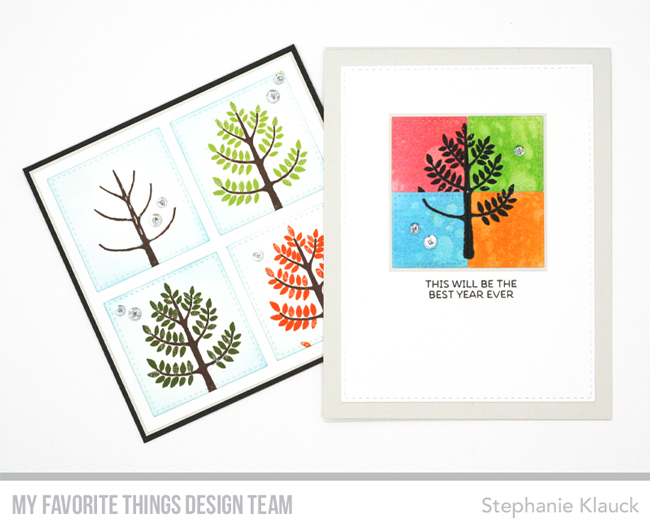 I stamped my seal and tree (coming in another stamp set soon!) onto white card stock and coloured them both in with Copic markers. I diecut the seal with the coordinating die and hand cut the tree, so it didn't have the white border. I created the winter scene for my images with some distress inks and card stock panels diecut with the new A2 Stitched Rectangle STAX Set 1 Die-namics. I LOVE these dies and will never put them down haha! 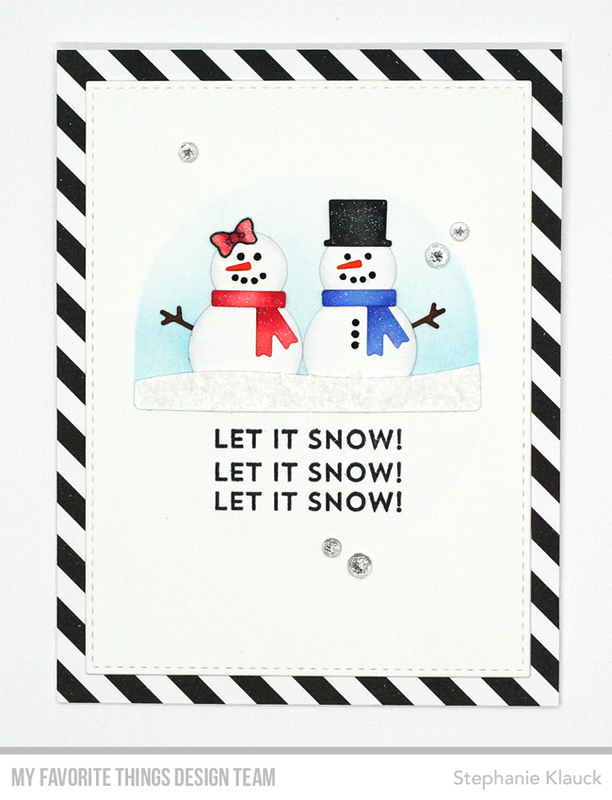 I added the panels to a card base covered with a red and white striped patterned paper from the Birthday Blowout paper pad, and I added a sentiment that I stamped from the Snow Globe Sentiments stamp set. I finished the card with Ice Cube Jewels on the tree and a star embellishment I had in my stash. Thanks so much for joining me for Day 5 of the countdown. Make sure to visit the MFT blog for more ideas and more peeks at the new products! Hello and welcome back! 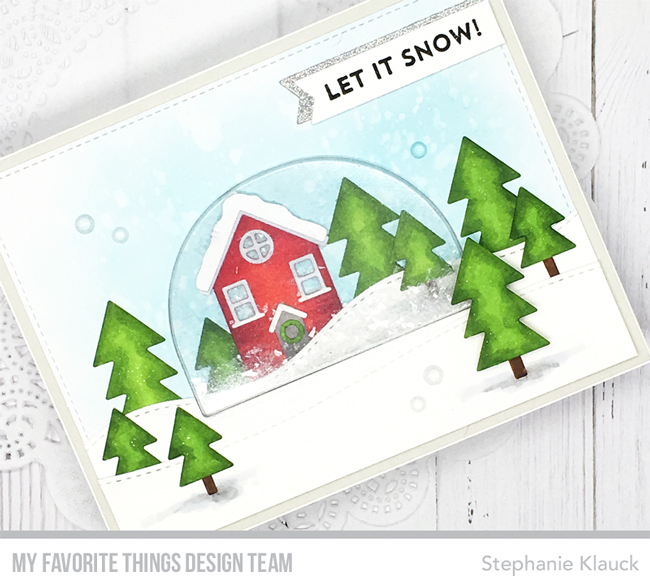 We've been counting down to the release of the newest My Favorite Things card kit, Snow Globe and the wait is over! 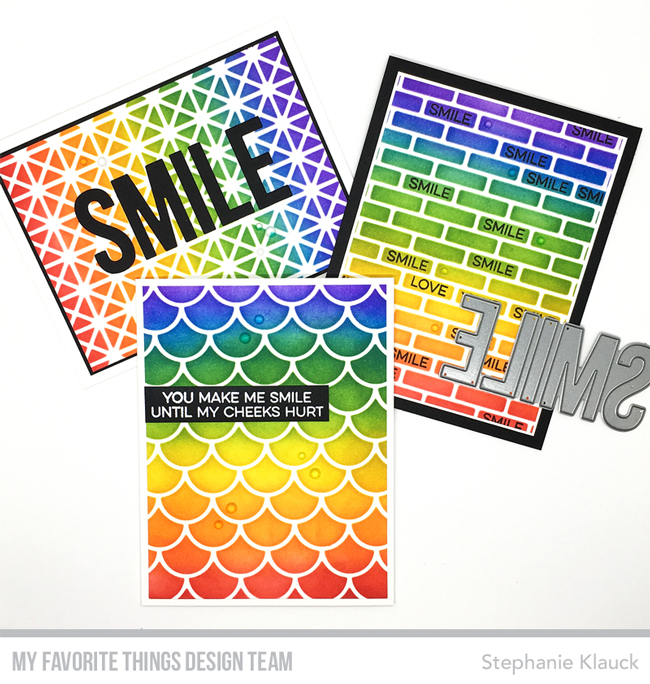 The full kit is available now at MFT Stamps! I love that by just adding a bow and a little bit of pink, I was able to make a snow'wo'man to go along with the snowman. To create the snow globe sky in the background I die cut the snow globe from some masking paper, added the negative piece to my card stock panel and used an ink blending tool to add the blue ink. I added a snow hill under the snowman and snow'wo'man and covered the entire thing with adhesive. I then added the Diamond Dust on top and pressed it into the adhesive to make my snow hill dimensional and sparkly. 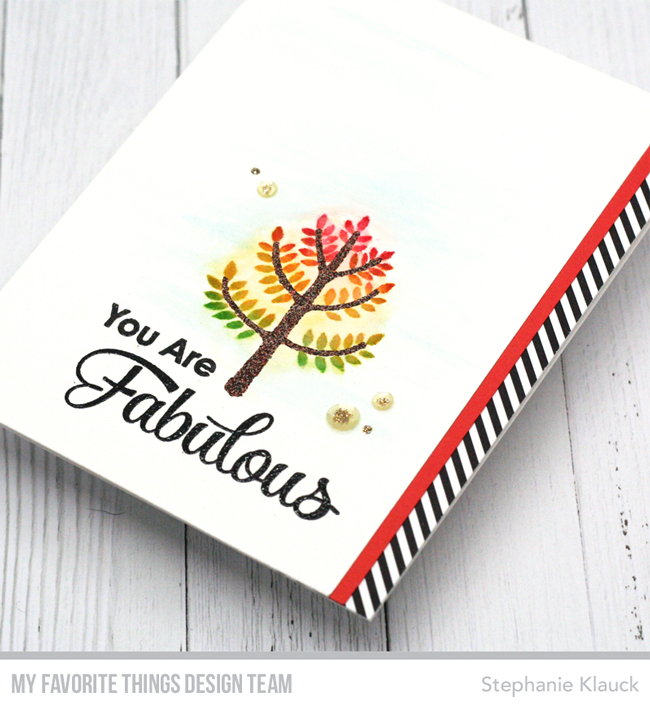 I stamped the sentiment repeatedly under the image to mimic the song lyrics and then I adhered the completed panel to a top folding card base that I covered with black and white striped patterned paper. 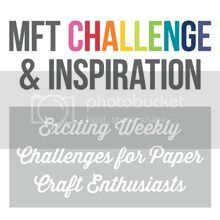 Make sure to head over to the MFT blog for more ideas using this months kit and don't forget to head over to the MFT shop to pick up your kit! :) Thanks for stopping by for the card kit release party! Hello and welcome back! 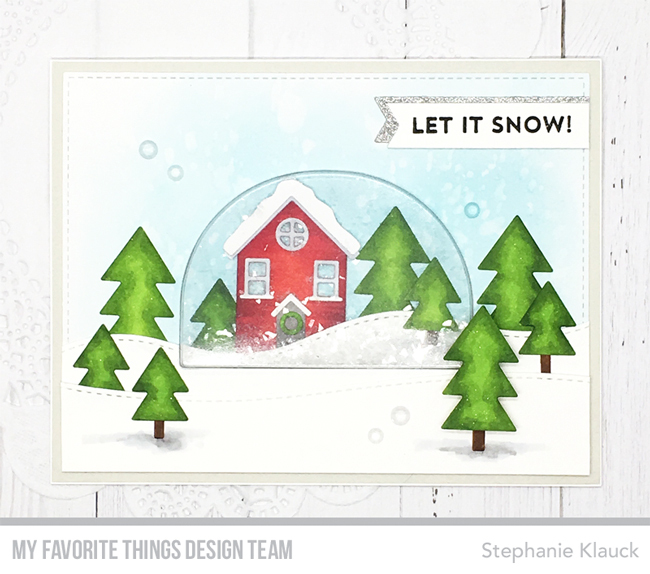 I'm back today with another card as we count down to the newest card kit from My Favorite Things called Snow Globe. I had so much fun creating my cards with this kit and still have so many ideas for cards I want to make! For today's card I created another snow-filled snow globe, but this time I added a snowman and a couple of trees to the inside. I love that there are so many options with the different scenes you can create. I die cut the panel from white card stock with the rectangle from Blueprints 13, and then I cut the snow globe opening into the panel. I created a snowy scene with the snowman, trees and some snow hills and then I filled it with Diamond Dust before sealing it all inside my dome shaker pouch. I added the bottom of the snow globe with Sno Cone card stock and stamped the sentiment with Black Licorice Dye ink. 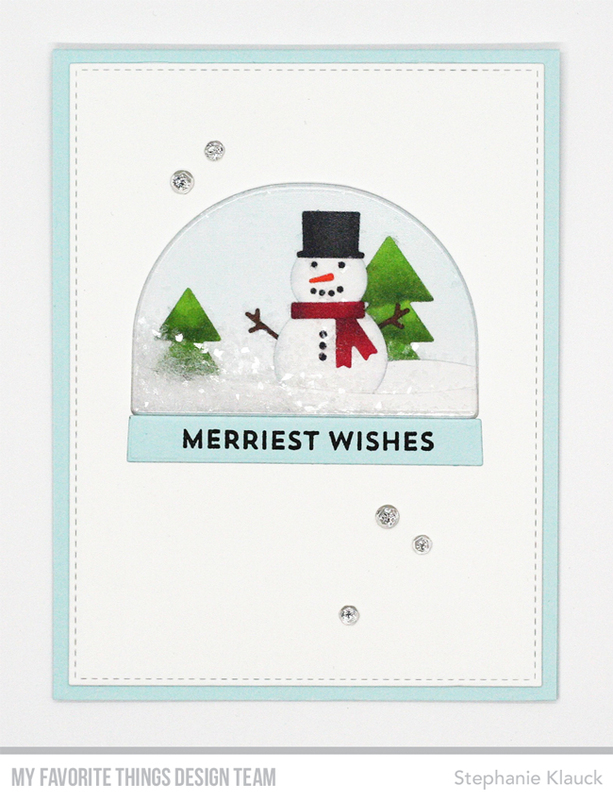 I completed the card by adding some clear sequins and adhering the finished panel to a Sno Cone card base. 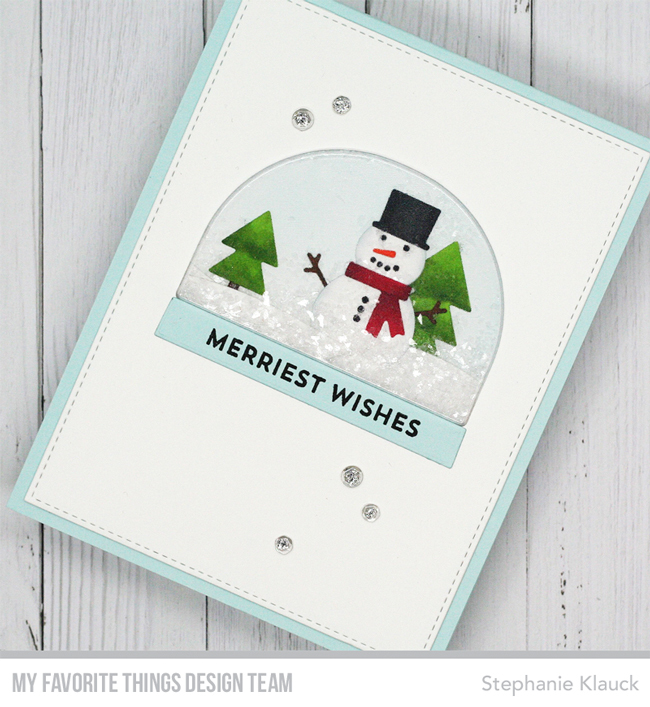 My Favorite Things Snow Globe Card Kit! Hello and welcome back! 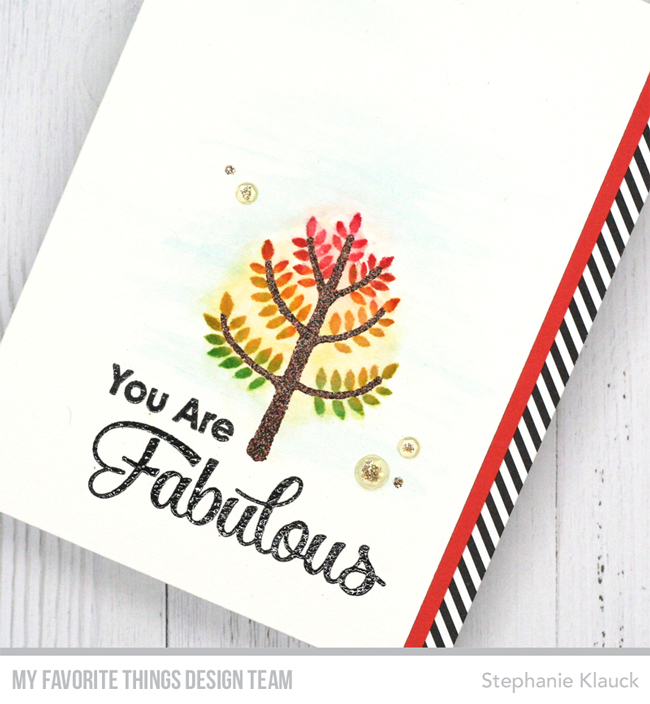 Today is the first day of the countdown for the My Favorite Things September card kit and I am so excited to share my cards with you over the next two days. 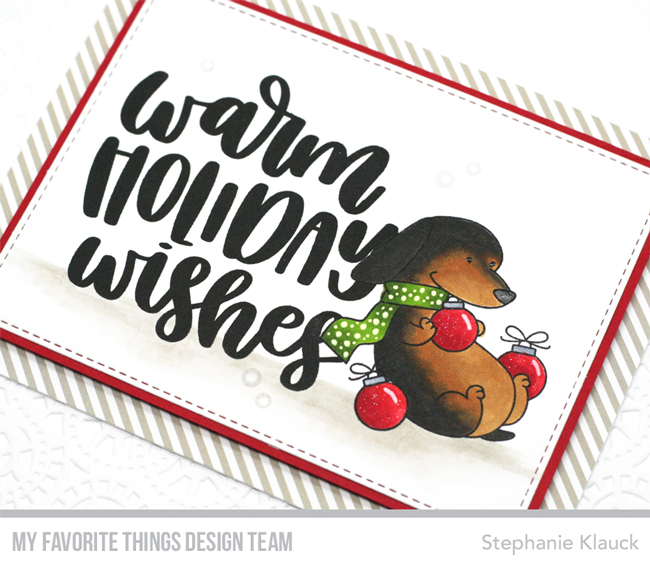 I love holiday card making and this holiday themed kit is perfect for all kinds of winter and holiday card designs. 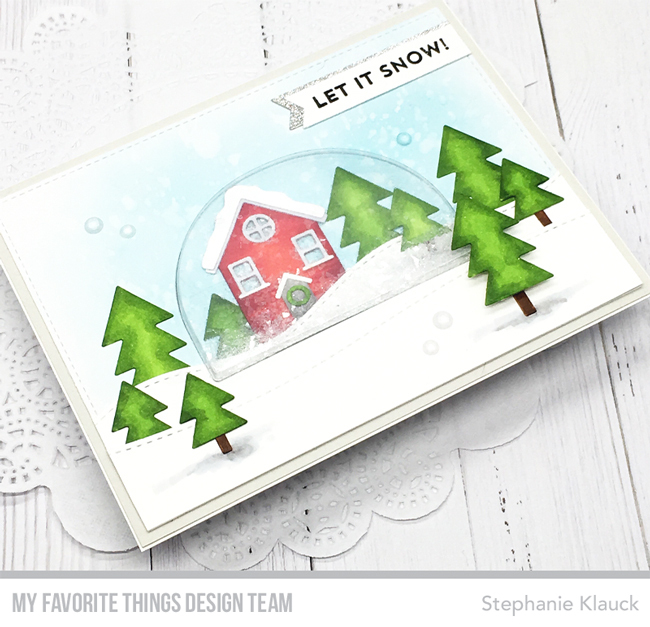 For my first card, I created a scenic snow globe card that extends right across the entire card front and not just inside the snow globe. I created my snowy landscape so it would be continuous across the card both inside and outside of the snow globe. I'm sharing the creation of this card in today's episode of MFTv so make sure to check it out to see how easy it is to create this beautiful scene. 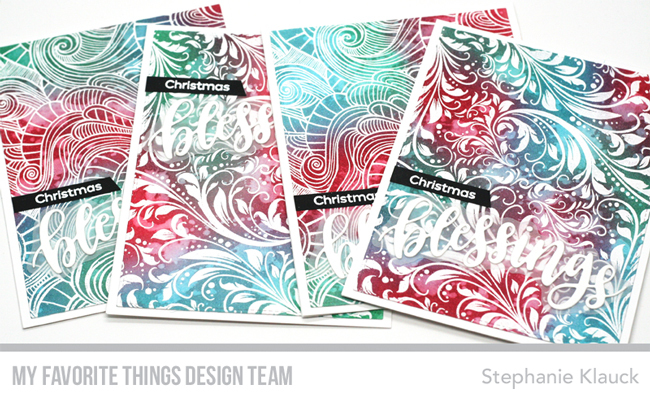 Make sure to check out the MFT blog for the full kit reveal and a ton of great card samples from the design team using this month's kit. Hello and welcome back. 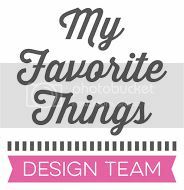 Today the MFT design team is sharing more projects using the awesome new September release products. For my card today I used the Modern Trees stamp set and paired it with an older sentiment stamp set that I love and definitely don't use enough. I stamped the trunk of my tree with Versamark ink onto watercolour paper and then I heat embossed it with Ranger Brick embossing powder. I love how realistic this embossing powder makes the wood on the tree look. I then stamped the tree top with Distress inks and added some water to the stamped images with a wet paintbrush. I did the multi coloured stamping by adding a little of each ink colour to the stamp before stamping it. 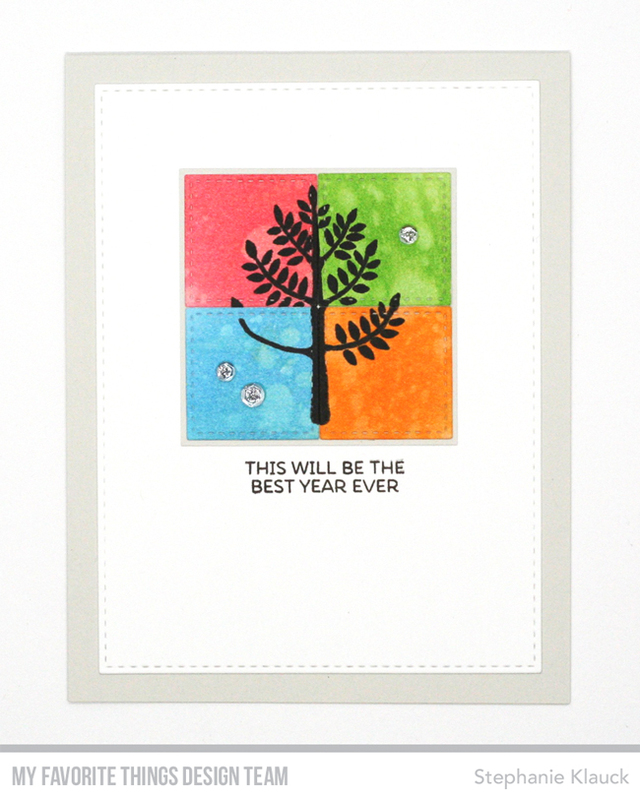 I stamped the sentiment in black under the tree and covered it with clear embossing powder for some added shine. I added a bit of blue colour behind the tree and then I finished the card with some yellow sequins and gold stickles. My Favorite Things September Release Party! Hello and welcome back! It's time to shop for the new September release products at My Favorite Things! All of the new products are now available at MFT Stamps and there are so many fun new stamps and dies! 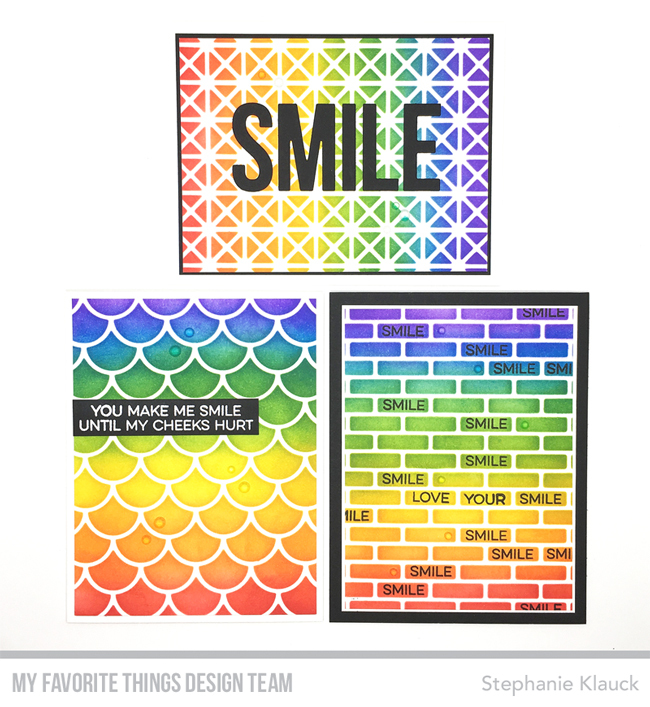 For the release party I created 3 very bright cards with some really great sentiments from the new All Smiles stamp set and the Double the Smiles Die-namics. I created all of these stenciled backgrounds on the weekend with the intention of adding the smile sentiments to them in different ways. I stamped the word smile all over the brick background, keeping the stamping on each brick and trying to create a graffiti look to it. I adhered it to a white card stock mat and then added it to a black card base. For the scallop background I stamped my sentiment onto black card stock with Versamark ink and heat embossed it with white embossing powder. I then trimmed it down and adhered it the card before adhering the entire panel to a white card base. I kept the Framework background super simple and just added the big die cut smile word right to the center. I completed all of them by adding Ice Cube Jewels to the card fronts in a random formation. Hello and welcome back. 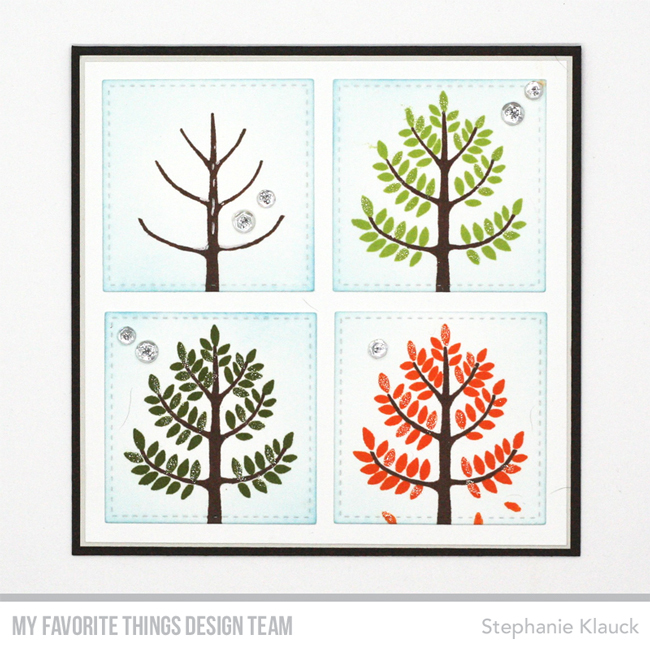 It's day 2 of the My Favorite Things September release countdown and today I have two cards to share using the new Modern Trees stamp set. I love this set because there are so many fun deisgns and techniques you can do with it since its a layering stamp set. I created two cards showing the four seasons on each of the cards using two different designs and two different inking techniques. I used the Stitched Square STAX Die-namics on both of my cards to create individual sqaures for each of the seasons. For the first card I stamped 4 trees changing the leaves for the seasons and on the second card I stamped the tree once in the center of 4 squares that had differnet ink colours to represent the seasons. I created both of these cards for the September release class so stay tuned tomorrow night for a PDF download of the class along with a video sharing how I created both of my cards. Hello and welcome back! 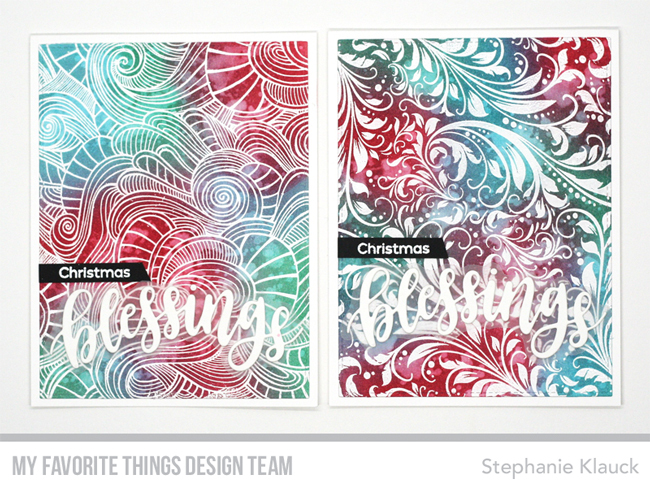 It's day 3 of the countdown to the My Favorite Things September release and I have a few cards to share that use one of my favourite releases from this month, the Blessing and Blessed Die-namics. I used a couple of older backgrounds (Wavy Coloring Book and Garden Flourish) and heat embossed them onto a white card stock panel with white embossing powder. 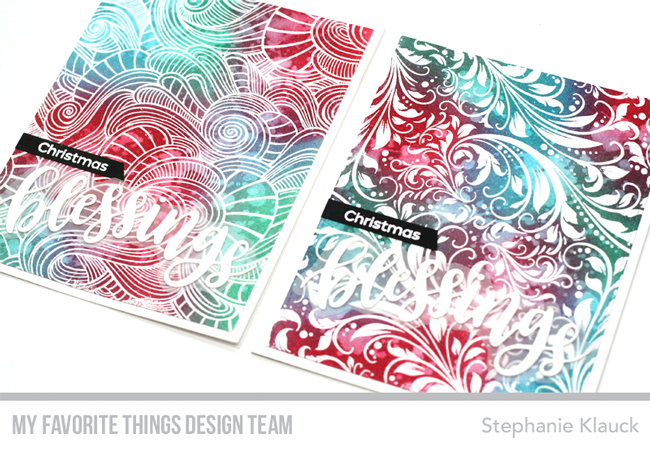 I then added Distress inks using one of my favourite holiday colour combinations - Peacock Feathers, Festive Berries and Lucky Clover. I created four backgrounds, and added the same ink colours to all four. I then added some water to give them a distressd look before trimming them down and adding them to a white card base. I stamped the Christmas part of the sentiment using a stamp from the new Bitty Bears stamp set onto black card stock and embossed it with white embossing powder. I diecut the word 'blessings' from white card stock 4 times and adhered them all to vellum. I then carefully cut around the vellum to leave a border around the word and then I adhered the sentiments to the card design to complete them. 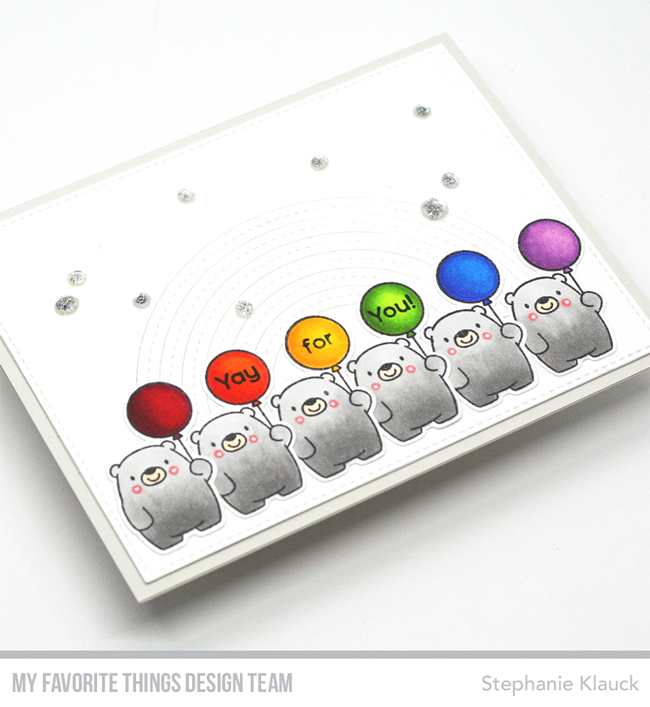 For today's card, I used the new Bitty Bears stamp set (and coordinating Die-namics) and created a rainbow themed card with a bunch of the same bear image holding a balloon. I stamped all of the bears onto white card stock and coloured them all in with Copic markers. I used the same grey colour for all of the bears and then I coloured their balloon for each colour of the rainbow. Once I had everything coloured, I die cut them all with the coordinating dies and then I created the background panel for my card. To do that I cut a white panel from the Blueprints 13 die set and then I die cut the Stitched Rainbow right in the center. I left the rainbow inlaid in the background and adhered the whole panel to a Grout Gray card base. 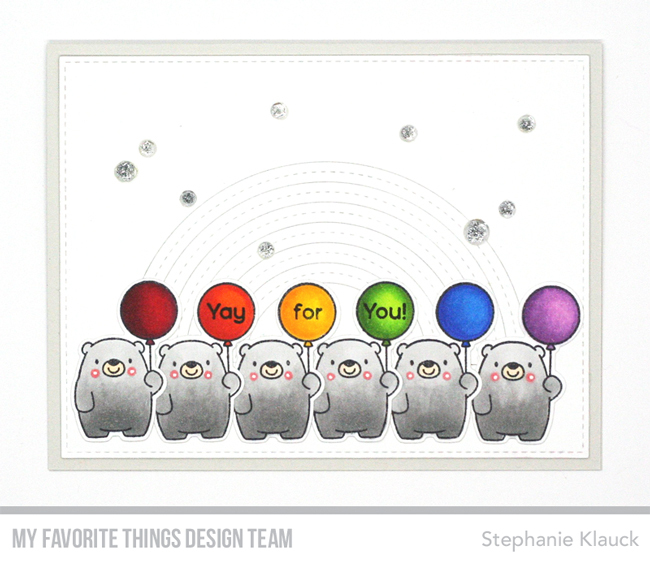 I stamped the sentiment in the balloons that the bears are holding by stamping each word one at a time and then I adhered all of the bears to the card. I finished it by adding some clear sequins scattered on the card front. 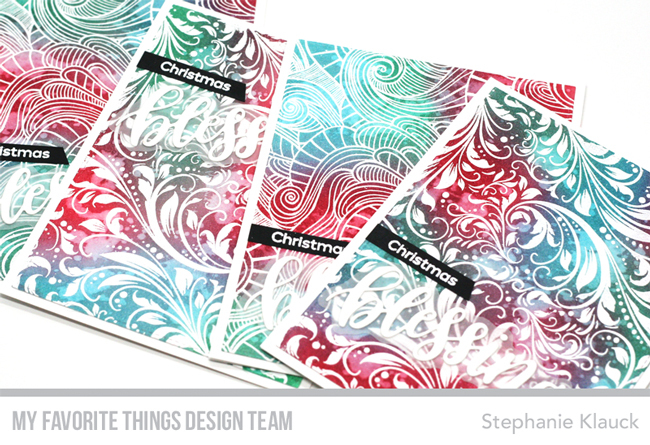 You can see more ideas for the new September release products on the MFT blog here. See you tomorrow for more countdown fun!